This must be the most amazing optical illusion on the internet. I desperately hope this is not true. I have high expectations for the neurons in my brain; I don't want them wasting precious energy making me remember the faces of Tom Cruise and Paris Hilton. If you're doing that, neurons, stop it right now! This is a little too weird for me: a house designed to look like it was made out of books. Even the tables and chairs are made out of "books." Far from being charmed, I was a little creeped out by this. Or maybe it's just all those horror novels I've been reading lately. 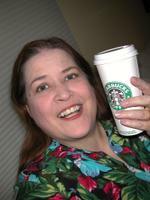 Today's post was powered by Starbucks cafe latte. I think you had one too many latte! Now, imagine a house made totally of Starbucks cups. That would creep ME out. Hang on a minute. Isn't my house made out of books? :::looking around, seeing piles and piles of bibliochaos obscuring everything else::::: I'm pretty sure mine IS made out of books. Or at least, they're offering structural support and delineating safe pathways through the forest of office supplies and the mountain range of laundry. So you're telling me, Mir, that I should be throwing all these Starbucks cups away instead of stacking them in my closet?